I'm feeling excited today because the month of May at 'The Organised You' is going to be wardrobe month, where I'll be sharing tips and tricks for getting your wardrobe and clothes sorted! I'll be sharing strategies for organising scarves, belts, kids' accessories and clothes, as well as the essentials for keeping your wardrobe organised. Let's dive in with the first in this series - jewellery display ideas! I don't have a big collection of jewellery by any means, but I do like to keep it organised and on display to encourage me to wear it more often. I think when I had my babies, I stopped wearing jewellery, especially earrings, as they were always pulling on them when I was feeding or we were playing. Now that they're not babies anymore (sob! ), I'm feeling like it's time to get back into jewellery-wearing. I got this simple jewellery display rack from ebay a year ago, and it is perfect for my earring and necklace collection. 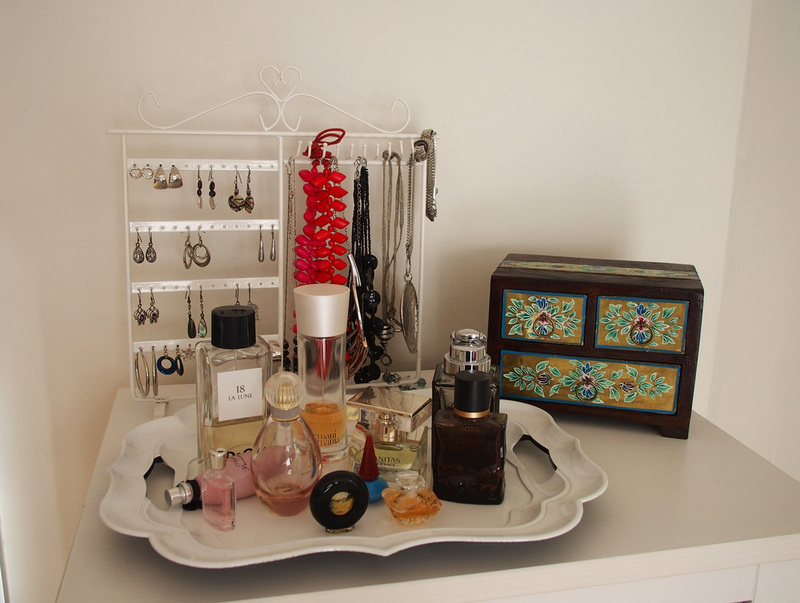 Next to it is my perfume collection, and a wooden jewellery box from Ishka for bracelets. This all sits atop our slimline dresser, which is just to the right of our walk-in wardrobe. The idea being that I can easily match jewellery to the outfit... on the rare occasion that I wear it! 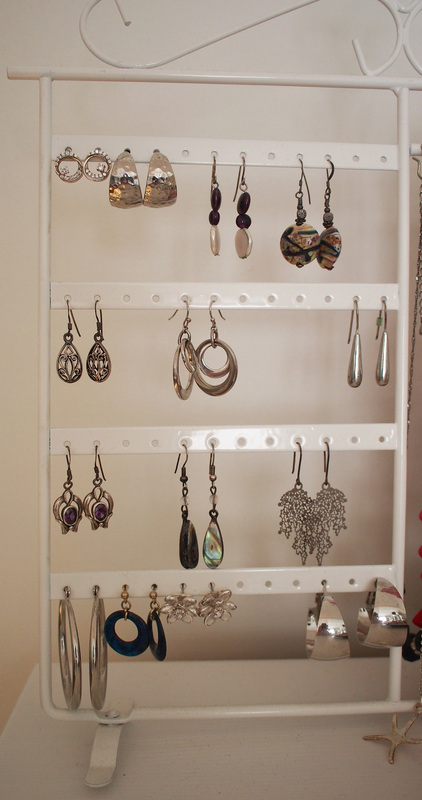 The left side of the display rack can hold up to 24 pairs of earrings. The right side has 10 hooks for necklaces or bracelets. The rack is only 30cm long so it is not suited for really long necklaces, but works perfectly for the ones I own. The wooden box holds chunky bracelets in the bottom drawer, and beaded ones in the top two drawers. I always take my jewellery off at night, as I find sleeping with rings on quite uncomfortable. I keep my rings, watch and necklace in our console drawer in the Wedgewood bowl on the right. It was a gift from my beautiful cousin (who was also my bridesmaid) on my wedding day, so it is very special. As long as my jewellery is organised, I'm a happy girl, but if I had a bit more space - or a bigger collection - here are some ideas I'd love to try out! How do you organise, store and display your jewellery?